Epilepsy is defined as a disorder of the brain characterized by an enduring predisposition to generate epileptic seizures which predominantly affects children and young adults. The prevalence of epilepsy is 9.9 to 41 per 100,000/year. Epilepsy can be due to genetic and acquired reasons with interaction of these factors in many cases. Subjects with epilepsy have vascular risk factors, including insulin resistance, elevated biomarkers of inflammation, oxidative stress, and elevated levels of plasma homocysteine (Hcy)., In addition, elevated Hcy levels, a risk factor for atherosclerosis, is common in subjects on long-term antiepileptic drugs (AEDs) therapy due to vitamin B deficiencies, particularly folate and vitamin B6. Carotid intima-media thickness (CIMT), used as an early marker for atherosclerosis, was evaluated in different age groups of epileptic subjects on AEDs. The results of CIMT in epileptic children treated with old generation AEDs were reported inconsistent,, while adults showed significant increase in IMT compared with controls. In addition, few studies have reported that folate supplementation may benefit on CIMT. In a meta-analysis conducted by Qin et al., it was observed that folate administration to subjects with high cardiovascular disease (CVD) risk and among studies with baseline levels of higher CIMT or a larger Hcy reduction was effective in reducing progression of CIMT. 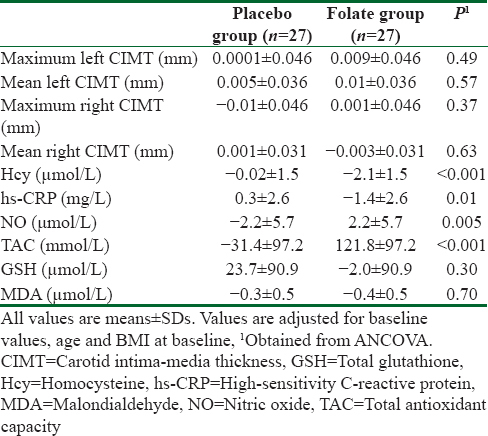 Furthermore, we have previously demonstrated that folate supplementation at a dosage of 5 mg/day to subjects with metabolic syndrome (MetS) had beneficial effects on CIMT and few metabolic profiles. Folate administration at a dosage of 400 μg/day among subjects with coronary artery diseases (CAD) for 7 weeks improved vascular function through effects on endothelial nitric oxide (NO) synthase and vascular oxidative stress. However, vitamin B12 (500 μg/day) and folic acid (400 μg/day) supplementation to elderly subjects with hyperhomocysteinemia for 2 years did not affect either endothelial function or low-grade systemic inflammation. According to existing evidence, folate may improve CIMT, biomarkers of inflammation, oxidative stress through Hcy-linked effects, and decreased production of reactive oxygen species. As Hcy concentrations are the cornerstone of this condition, folate supplementation through influencing Hcy levels might be useful in the management of CIMT and metabolic profiles of children receiving carbamazepine. However, whether folate supplementation has direct benefits on CIMT, biomarkers of inflammation, and oxidative stress in epileptic children receiving carbamazepine has to date not been evaluated. The current study was, therefore, conducted to determine the effects of folate supplementation on CIMT, biomarkers of inflammation, and oxidative stress in epileptic children receiving carbamazepine. This randomized, double-blind, placebo-controlled clinical trial, registered in the Iranian website for registration of clinical trials (http://www.irct.ir) as IRCT201704225623N110, was conducted on 54 epileptic children aged 2–12 years old receiving carbamazepine monotherapy from March 2015 to December 2016 who were referred to the Naghavi Hospital in Kashan, Iran. This trial was performed in accordance with the Declaration of Helsinki and informed consent was taken from all patient's parents. The ethical committee of the Kashan University of Medical Sciences (KAUMS) approved the study (no. 1393.6011). Taking folate supplements or other therapies such as vitamins or antioxidants within the last 3 months, unwillingness to cooperate, metabolic diseases, chronic medical conditions including anemia and gastrointestinal disease associated with malabsorption, neuropsychological diseases, and neurodegenerative disorders were excluded from the study. At first, to decrease potential confounding effects, all participants were stratified randomization according to age and body mass index (BMI). Then, participants in each block were randomly allocated into two treatment groups (27 participants in each group) to take either 5 mg/day folate as tablet (Tehran Darou, Tehran, Iran) or placebo (Barij Essence, Kashan, Iran) for 12 weeks. Both folate supplements and placebo tablets had similar packaging. Compliance to the folate intake was evaluated through quantification of plasma Hcy values. The use of folate supplementation and the placebo during the study was checked by asking subjects to return the medication containers and receiving brief daily cell phone reminders to take the supplements. All participant's parents completed three-dietary records (two week days and one weekend) at baseline, Week 3, 8, and 11 of the trial. To obtain nutrient intakes of patients according to 3-day food records, we applied the Nutritionist IV software (First Databank, San Bruno, CA) adopted for the Iranian food pattern. Randomization assignment was conducted using a computer-generated random numbers. Randomization and allocation concealment were conducted by the researchers and participants and were carried out by a trained staff at the pediatrics clinic. Another person, who was not involved in the trial and not aware of random sequences, assigned the subjects to the numbered bottles of tablets. Weight (kg) and height (cm) (Seca, Hamburg, Germany) were determined at baseline and after the intervention without shoes in a minimal clothing condition in the pediatrics clinic by a trained staff. BMI was calculated as weight in kilograms divided by height in meters squared. We considered CIMT as primary outcome variable and biomarkers of inflammation and oxidative stress as secondary outcome variables. Measurement of the CIMT levels was conducted in the participants at the 2-cm distance of the common carotid bifurcation, by the same sonographist, at baseline and after the 12-week intervention using a Doppler ultrasonography device (Samsung Medison V20, Korea) with linear multifrequencies of 7.5- to 10-MHz probe. Automated systems provide the mean value of 150 measurements performed on a 10-mm segment of common carotid artery instantaneously. The physician was blinded to any clinical information of the subjects. About 5 ml blood samples were collected at baseline and after the intervention at the Kashan Reference Laboratory. Plasma Hcy values were assessed by the method of enzyme immunoassay by Hcy kit (Axis-Shield Diagnostics, UK). Serum hs-CRP levels were determined by an enzyme-linked immunosorbent assay (ELISA) kit (LDN, Nordhorn, Germany) with intra- and inter-assay coefficient variances (CVs) of 3.1 and 5.5%, respectively. The plasma NO values were assessed using the Griess method. Plasma total antioxidant capacity (TAC) levels were evaluated by the use of ferric reducing antioxidant power developed by Benzie and Strain, total glutathione (GSH) by the method of Beutler and Gelbart, and malondialdehyde (MDA) concentrations by the thiobarbituric acid reactive substances spectrophotometric test with inter- and intra-assay CVs below 5%. To determine the normal distribution of the variables, we applied the Kolmogorov–Smirnov test. The intention-to-treat (ITT) analysis of the primary study endpoint was applied for all of the randomly allocated participants. Anthropometric measures and dietary intakes were compared between intervention groups, using the independent samples t-test. To determine the effects of folate supplementation on CIMT, biomarkers of inflammation, and oxidative stress, we used the independent samples t-test. To control confounding variables, including baseline values, age, and baseline BMI, we used analysis of covariance (ANCOVA). Differences in proportions were evaluated by the Fisher's exact test. P values <0.05 were considered statistically significant. All statistical analyses were done by the use of the Statistical Package for Social Science version 18 (SPSS Inc., Chicago, Illinois, USA). To determine sample size, we used a randomized clinical trial sample size calculation formula where type one (α) and type two error (β) were 0.05 and 0.20 (power = 80%), respectively. According to a previous trial, we used 0.006 mm as SD and 0.005 mm as the change in mean (d) of CIMT as a main variable. Based on the formula, we needed 23 participants in each group; after considering of 4 dropouts in each group, the final sample size was 27 participants in each group. Among patients in folate and placebo groups, two subjects withdrawn due to personal reasons [Figure 1]. However, all 54 participants (27 participants in each group) were included in the final analysis using ITT principle. Overall, the compliance rate was high, such that higher than 90% of tablets were consumed throughout the study in both groups. 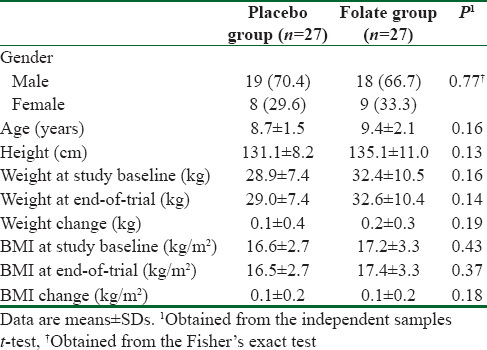 The mean age, height, baseline weight, BMI, as well as their means after the 12-week intervention were not significant between folate supplements and placebo groups [Table 1]. Based on the 3-day dietary records obtained at baseline, Week 3, 8, and 11 of the study, we observed no significant difference in mean dietary macro- and micronutrient intakes between the two groups (data not shown). After the 12-week intervention, compared with the placebo, folate supplementation resulted in a significant reduction in plasma Hcy (changes from baseline −2.1 ± 2.5 vs. +0.1 ± 0.4 μmol/L, P < 0.001), serum hs-CRP (changes from baseline −1.5 ± 3.5 vs. +0.4 ± 1.4 mg/L, P = 0.01), significant increases in NO (changes from baseline +1.9 ± 5.8 vs. −2.0 ± 6.4 μmol/L, P = 0.02), and TAC concentrations (changes from baseline +88.6 ± 116.0 vs. +1.8 ± 77.4 mmol/L, P = 0.002) [Table 2]. We did not observe any significant effects in mean levels of left and right CIMT, maximum levels of left and right CIMT, and GSH and MDA levels following the supplementation of folate compared with the placebo. There was a significant difference in baseline levels of maximum of left CIMT (P = 0.01), mean of left CIMT (P = 0.04), and plasma TAC (P < 0.001) between the two groups. Therefore, we adjusted the analysis for baseline values of biochemical parameters, age, and baseline BMI. When we adjusted the analysis for baseline values of biochemical parameters, age and baseline BMI, findings did not change [Table 3]. In the current study, we evaluated the effects of folate supplementation on CIMT, biomarkers of inflammation, and oxidative stress in epileptic children receiving carbamazepine. We demonstrated that 5 mg/day of folate supplementation to epileptic children receiving carbamazepine for 12 weeks had beneficial effects on serum hs-CRP, plasma NO, and TAC levels; however, it did not affect CIMT, and plasma GSH and MDA levels. We demonstrated that folate supplementation to epileptic children receiving carbamazepine for 12 weeks did not affect CIMT compared with the placebo. Few studies have evaluated the effects of folate supplementation on CIMT. Supporting our study, 3-month supplementation with 5 mg/day of folate had no effect on endothelial function or carotid artery IMT in renal transplant recipients. In addition, treatment of hyperhomocysteinemia in hemodialysis subjects with daily 15 mg folate, 50 mg vitamin B6, and 1 mg vitamin B12 for 6 months significantly decreased Hcy concentrations, but did not affect IMT. However, an 18-month supplementation with 5 mg/day of folate resulted in a significant decrease in IMT in subjects with at least one CVD risk. Furthermore, supplementation with 2.5 mg of folate, 25 mg of vitamin B6, and 0.5 mg of vitamin B12 for 1 year significantly reduced IMT in subjects at risk to cerebral ischemia. CIMT is an intermediate phenotype for early atherosclerosis as well as for CHD and cerebral ischemic events. The different findings of our study with others might be explained by different study designs, different duration of interventions, different dosages of folate used, as well as different participants of the study. Our study has shown that folate supplementation to epileptic children receiving carbamazepine for 12 weeks resulted in a significant reduction in serum hs-CRP and a significant increase in plasma NO levels compared with the placebo. In a study conducted by Ishikawa et al., it was observed that daily generalized motor seizures resulted in elevated levels of inflammatory cytokines. Chronic increased inflammatory factors have been shown to play important roles in diverse chronic diseases such as CVD and neurological diseases., There are some reports on the relationship between folate supplementation and inflammatory markers. We have previously shown that folate supplementation at a dosage of 5 mg/day to subjects with MetS for 12 weeks led to a significant decrease in serum hs-CRP and a significant elevation in plasma NO levels. Furthermore, supplementation with B-group vitamins containing 5 mg/day folate resulted in a significant reduction in CRP concentrations among subjects with acute ischemic stroke for 14 days. However, some research conducted by other authors showed no effect of folate supplementation on CRP levels in chronic smokers for 4 weeks and in populations with stable CAD for 24 months. Increased levels of CRP are associated with an increased risk of diabetes and CVD., Therefore, CRP levels is not only an inflammation marker, but is also considered as a risk indicator for CVD. NO is a vasodilator that exerts antiplatelet, antioxidant, and antiproliferative effects. In addition, endothelium-derived NO has been shown to be of crucial importance in cardiovascular protection. It has been proposed that Hcy induces gene expression related to inflammatory factors, possibly by enhancing oxidative stress and subsequent nuclear factor kappa B activation and increase of poly ADP ribose polymerase activation. Therefore, decreased levels of Hcy may result in decreased concentrations of inflammatory factors. The current study demonstrated that folate supplementation, compared with the placebo, to epileptic children receiving carbamazepine for 12 weeks was associated with a significant elevation in plasma TAC, but did not affect plasma GSH and MDA levels. The effects of AEDs on generation of oxidative stress have been investigated., The membrane lipid peroxidation due to an increase in free radicals or activating decrease of antioxidant defense mechanisms has been suggested to be causally involved in some forms of epilepsy. Racek et al. reported that folate had an effective antioxidant role in subjects with hyperhomocysteinemia for 8 weeks due to decreased production of free radicals and Hcy levels. In addition, in an animal study, folate intake reduced intravascular oxidative stress. In a study by Aghamohammadi et al., it was also seen that folate supplementation at a dosage of 5 mg/day to subjects with T2DM for 8 weeks lowered plasma Hcy and MDA, and improved TAC levels. Another study conducted by Shidfar et al., folate supplementation at dosage of 5 mg/day for 8 weeks in adults with hypercholesterolemia led to an improvement in TAC levels. Unlike, folate supplementation did not influence function or biomarkers of oxidant stress among subjects with T1DM and microalbuminuria for 2 months. Increased biomarkers of oxidative stress are blamed for the pathogenesis of epilepsy as a potential mechanism. Liang and Patel have indicated that persistent seizures caused oxidative damage. Moreover, several animal and genetic studies have shown an increase in mitochondrial oxidative stress and subsequent cell damage after persistent seizures., It has been reported that the increased amount of active oxygen species or reduced activity of antioxidative defense mechanisms may result in greater frequency of seizure. Therefore, antioxidative systems inhibit oxidative stress. Decreased Hcy levels following intake of folate decreases cellular and protein injury via oxidant mechanisms. In addition, the antioxidant effect of folate was attributed, in part, to transcriptional regulation of NADPH oxidase. Our study had few limitations. Owing to funding limitations, we could not assess the effects of folate supplementation on plasma folate levels, and gene expression related to inflammation and oxidative stress. Furthermore, the current study was relatively of short duration of intervention. Long-term interventions might result in greater changes in CIMT levels. We did not find a similar study about folate supplementation in epileptic children for determining the sample size based on main outcome (CIMT); therefore, the sample size was calculated based on folate supplementation in older adults. This should be considered in the interpretation of our findings. Overall, 5 mg/day of folate supplementation for 12 weeks among epileptic children receiving carbamazepine had beneficial effects on hs-CRP, NO, and TAC levels, but did not affect CIMT, and GSH and MDA levels. The current study was founded by a grant from the Vice-chancellor for Research, KUMS, Iran. Sanchez S, Rincon F. Status epilepticus: Epidemiology and public health needs. J Clin Med 2016;5:71. Thurman DJ, Beghi E, Begley CE, Berg AT, Buchhalter JR, Ding D, et al. Standards for epidemiologic studies and surveillance of epilepsy. Epilepsia 2011;52(Suppl 7):2-6. Elliott JO, Jacobson MP, Haneef Z. Cardiovascular risk factors and homocysteine in epilepsy. Epilepsy Res 2007;76:113-23. Hamed SA, Hamed EA, Hamdy R, Nabeshima T. Vascular risk factors and oxidative stress as independent predictors of asymptomatic atherosclerosis in adult patients with epilepsy. Epilepsy Res 2007;74:183-92. Coppola G, Ingrosso D, Operto FF, Signoriello G, Lattanzio F, Barone E, et al. Role of folic acid depletion on homocysteine serum level in children and adolescents with epilepsy and different MTHFR C677T genotypes. Seizure 2012;21:340-3. Keenan N, Sadlier LG, Wiltshire E. Vascular function and risk factors in children with epilepsy: Associations with sodium valproate and carbamazepine. Epilepsy Res 2014;108:1087-94. Yis U, Dogan M. Effects of oxcarbazepine treatment on serum lipids and carotid intima media thickness in children. Brain Dev 2012;34:185-8. Chuang YC, Chuang HY, Lin TK, Chang CC, Lu CH, Chang WN, et al. Effects of long-term antiepileptic drug monotherapy on vascular risk factors and atherosclerosis. Epilepsia 2012;53:120-8. Qin X, Xu M, Zhang Y, Li J, Xu X, Wang X, et al. Effect of folic acid supplementation on the progression of carotid intima-media thickness: A meta-analysis of randomized controlled trials. Atherosclerosis 2012;222:307-13. Talari HR, Rafiee M, Farrokhian A, Raygan F, Bahmani F, Darooghegi Mofrad M, et al. The effects of folate supplementation on carotid intima-media thickness and metabolic status in patients with metabolic syndrome. Ann Nutr Metab 2016;69:41-50. Shirodaria C, Antoniades C, Lee J, Jackson CE, Robson MD, Francis JM, et al. Global improvement of vascular function and redox state with low-dose folic acid: Implications for folate therapy in patients with coronary artery disease. Circulation 2007;115:2262-70.
van Dijk SC, Enneman AW, Swart KM, van Wijngaarden JP, Ham AC, de Jonge R, et al. Effect of vitamin B12 and folic acid supplementation on biomarkers of endothelial function and inflammation among elderly individuals with hyperhomocysteinemia. Vasc Med 2016;21:91-8. Marcucci R, Zanazzi M, Bertoni E, Rosati A, Fedi S, Lenti M, et al. Vitamin supplementation reduces the progression of atherosclerosis in hyperhomocysteinemic renal-transplant recipients. Transplantation 2003;75:1551-5. Ullegaddi R, Powers HJ, Gariballa SE. B-group vitamin supplementation mitigates oxidative damage after acute ischaemic stroke. Clin Sci (Lond) 2004;107:477-84. Tatsch E, Bochi GV, Pereira Rda S, Kober H, Agertt VA, de Campos MM, et al. A simple and inexpensive automated technique for measurement of serum nitrite/nitrate. Clin Biochem 2011;44:348-50. Beutler E, Gelbart T. Plasma glutathione in health and in patients with malignant disease. J Lab Clin Med 1985;105:581-4. Janero DR. Malondialdehyde and thiobarbituric acid-reactivity as diagnostic indices of lipid peroxidation and peroxidative tissue injury. Free Radic Biol Med 1990;9:515-40. Durga J, Bots ML, Schouten EG, Grobbee DE, Kok FJ, Verhoef P. Effect of 3 y of folic acid supplementation on the progression of carotid intima-media thickness and carotid arterial stiffness in older adults. Am J Clin Nutr 2011;93:941-9. Austen SK, Fassett RG, Geraghty DP, Coombes JS. Folate supplementation fails to affect vascular function and carotid artery intima media thickness in cyclosporin A-treated renal transplant recipients. Clin Nephrol 2006;66:373-9. Tungkasereerak P, Ong-ajyooth L, Chaiyasoot W, Ong-ajyooth S, Leowattana W, Vasuvattakul S, et al. Effect of short-term folate and vitamin B supplementation on blood homocysteine level and carotid artery wall thickness in chronic hemodialysis patients. J Med Assoc Thai 2006;89:1187-93. Ntaios G, Savopoulos C, Karamitsos D, Economou I, Destanis E, Chryssogonidis I, et al. The effect of folic acid supplementation on carotid intima-media thickness in patients with cardiovascular risk: A randomized, placebo-controlled trial. Int J Cardiol 2010;143:16-9. Till U, Rohl P, Jentsch A, Till H, Muller A, Bellstedt K, et al. Decrease of carotid intima-media thickness in patients at risk to cerebral ischemia after supplementation with folic acid, Vitamins B6 and B12. Atherosclerosis 2005;181:131-5. Bots ML, de Jong PT, Hofman A, Grobbee DE. Left, right, near or far wall common carotid intima-media thickness measurements: Associations with cardiovascular disease and lower extremity arterial atherosclerosis. J Clin Epidemiol 1997;50:801-7. Ishikawa N, Kobayashi Y, Fujii Y, Kobayashi M. Increased interleukin-6 and high-sensitivity C-reactive protein levels in pediatric epilepsy patients with frequent, refractory generalized motor seizures. Seizure 2015;25:136-40. Assadpour Piranfar M. The Correlation between High-sensitivity C-reactive protein (hsCRP) serum levels and severity of coronary atherosclerosis. Int Cardiovasc Res J 2014;8:6-8. Song IU, Chung SW, Kim JS, Lee KS. Association between high-sensitivity C-reactive protein and risk of early idiopathic Parkinson's disease. Neurol Sci 2011;32:31-4. Ullegaddi R, Powers HJ, Gariballa SE. Antioxidant supplementation with or without B-group vitamins after acute ischemic stroke: A randomized controlled trial. JPEN J Parenter Enteral Nutr 2006;30:108-14. Mangoni AA, Arya R, Ford E, Asonganyi B, Sherwood RA, Ouldred E, et al. Effects of folic acid supplementation on inflammatory and thrombogenic markers in chronic smokers. A randomised controlled trial. Thromb Res 2003;110:13-7. Liem A, Reynierse-Buitenwerf GH, Zwinderman AH, Jukema JW, van Veldhuisen DJ. Secondary prevention with folic acid: Effects on clinical outcomes. J Am Coll Cardiol 2003;41:2105-13. Dehghan A, Kardys I, de Maat MP, Uitterlinden AG, Sijbrands EJ, Bootsma AH, et al. Genetic variation, C-reactive protein levels, and incidence of diabetes. Diabetes 2007;56:872-8. Madej A, Boldys A, Buldak L, Labuzek K, Basiak M, Okopien B. Short-term antihypertensive therapy lowers the C-reactive protein level. Postepy Hig Med Dosw (Online) 2012;66:78-84. Cozzi MR, Guglielmini G, Battiston M, Momi S, Lombardi E, Miller EC, et al. Visualization of nitric oxide production by individual platelets during adhesion in flowing blood. Blood 2015;125:697-705. Papatheodorou L, Weiss N. Vascular oxidant stress and inflammation in hyperhomocysteinemia. Antioxid Redox Signal 2007;9:1941-58. Xie JJ, Yu X, Liao YH, Chen J, Yao R, Chen Y, et al. Poly (ADP-Ribose) polymerase inhibition attenuates atherosclerotic plaque development in ApoE-/- mice with hyperhomocysteinemia. J Atheroscler Thromb 2009;16:641-53. Arroyo S, de la Morena A. Life-threatening adverse events of antiepileptic drugs. Epilepsy Res 2001;47:155-74. Del Maestro RF. An approach to free radicals in medicine and biology. Acta Physiol Scand Suppl 1980;492:153-68. Jesberger JA, Richardson JS. Oxygen free radicals and brain dysfunction. Int J Neurosci 1991;57:1-17. Racek J, Rusnakova H, Trefil L, Siala KK. The influence of folate and antioxidants on homocysteine levels and oxidative stress in patients with hyperlipidemia and hyperhomocysteinemia. Physiol Res 2005;54:87-95. Shukla N, Angelini GD, Jeremy JY. The administration of folic acid reduces intravascular oxidative stress in diabetic rabbits. Metabolism 2008;57:774-81. Aghamohammadi V, Gargari BP, Aliasgharzadeh A. Effect of folic acid supplementation on homocysteine, serum total antioxidant capacity, and malondialdehyde in patients with type 2 diabetes mellitus. J Am Coll Nutr 2011;30:210-5. Shidfar F, Homayounfar R, Fereshtehnejad SM, Kalani A. 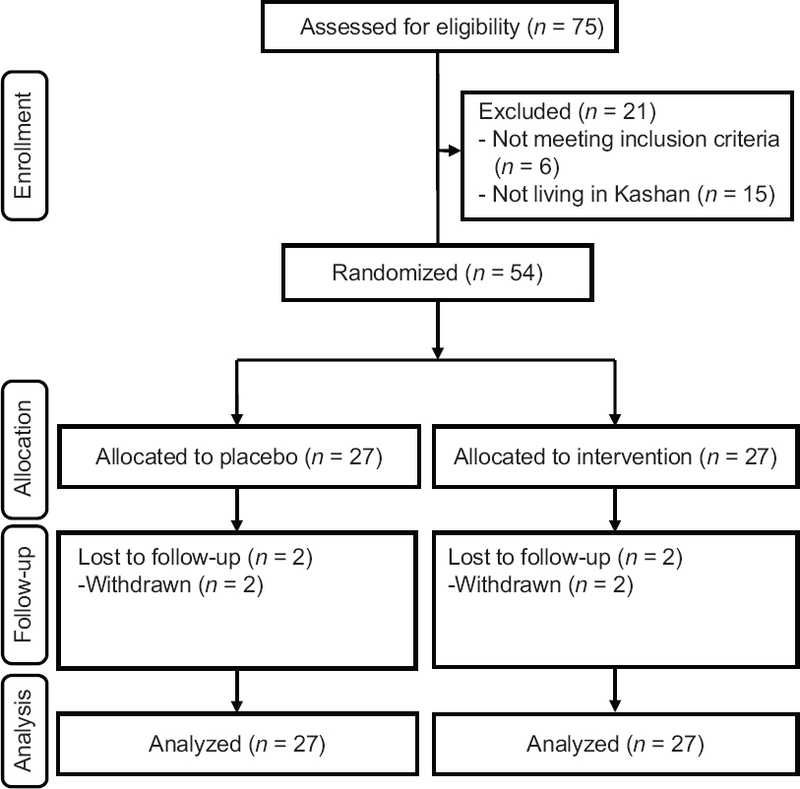 Effect of folate supplementation on serum homocysteine and plasma total antioxidant capacity in hypercholesterolemic adults under lovastatin treatment: A double-blind randomized controlled clinical trial. Arch Med Res 2009;40:380-6. Wotherspoon F, Laight DW, Turner C, Meeking DR, Allard SE, Munday LJ, et al. The effect of oral folic acid upon plasma homocysteine, endothelial function and oxidative stress in patients with type 1 diabetes and microalbuminuria. Int J Clin Pract 2008;62:569-74. Chang SJ, Yu BC. Mitochondrial matters of the brain: Mitochondrial dysfunction and oxidative status in epilepsy. J Bioenerg Biomembr 2010;42:457-9. Liang LP, Patel M. Seizure-induced changes in mitochondrial redox status. Free Radic Biol Med 2006;40:316-22. Bruce AJ, Baudry M. Oxygen free radicals in rat limbic structures after kainate-induced seizures. Free Radic Biol Med 1995;18:993-1002. Gluck MR, Jayatilleke E, Shaw S, Rowan AJ, Haroutunian V. CNS oxidative stress associated with the kainic acid rodent model of experimental epilepsy. Epilepsy Res 2000;39:63-71. Willmore LJ, Rubin JJ. Antiperoxidant pretreatment and iron-induced epileptiform discharges in the rat: EEG and histopathologic studies. Neurology 1981;31:63-9. McCord JM. The evolution of free radicals and oxidative stress. Am J Med 2000;108:652-9. Hoffman M. Hypothesis: Hyperhomocysteinemia is an indicator of oxidant stress. Med Hypotheses 2011;77:1088-93. Sarna LK, Wu N, Wang P, Hwang SY, Siow YL, O K. Folic acid supplementation attenuates high fat diet induced hepatic oxidative stress via regulation of NADPH oxidase. Can J Physiol Pharmacol 2012;90:155-65.